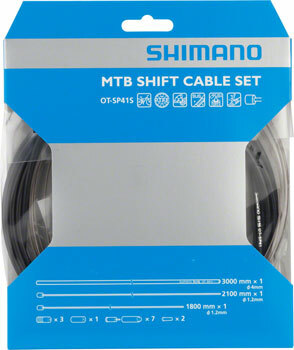 Shimano MTB PTFE Derailleur Cable and Housing Sets include 3000mm x 4mm housing x 1, 2100mm x 1.2mm cable x 1, 1800mm x 1.2mm cable x 1, 4 end caps, 7 rubber shields & 2 crimps. Cable and housing set designed to maximize performance of shift levers, PTFE coated stainless steel cable and Factory greased SP41 housing. This cable and housing kit replaces and exceeds the older XTR kits.